From the deepest depths of the ocean emerges the Mechannita H20 Unit to fight the galaxies fiercest monsters! 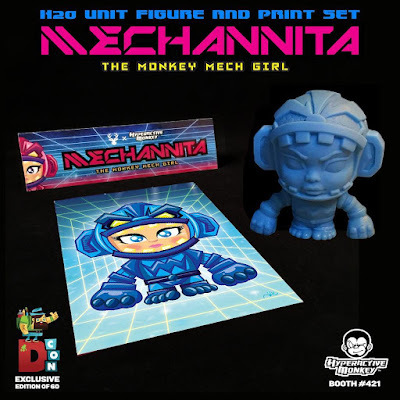 The Blot was lucky enough to get Hyperactive Monkey’s first release of The Monkey Mech Girl at SDCC 2016 last summer, and this figure is seriously awesome. Mechannita’s second colorway will be released next week exclusively at Designer Con 2016! The all blue H2O Unit Edition Mechannita is limited to just 60 pieces and will retail for just $20 at the Hyperactive Monkey DCon booth #421. Each figure features 3 points of articulation (arms and head), and comes bagged with a colorway specific header card and limited edition print.